When it comes to reviewing films, there are two kinds of masterpieces. One is the film in which every single scene is immaculately perfect, and your emotional involvement supports and compliments this perfection. The other, more contentious kind is a film which on paper is riddled with faults, but the experience of watching it is so intoxicating that all such faults can be forgiven or forgotten. With war films, the first camp is defined by Full Metal Jacket and the second by Apocalypse Now. Where Stanley Kubrick's film is meticulously constructed and judged to clinical precision, Francis Ford Coppola's is simultaneously a bloated, meandering mess and one of the greatest films of all time. Full Metal Jacket is the more accessible and perhaps more rewarding, but on the big screen Apocalypse Now is nothing short of knockout, as all the elements of Coppola's epic collide in a full-on and frightening story of darkness, madness and war. As with so many great films, the production history of Apocalypse Now leads us to believe that things should have turned out very differently. John Milius, who had written much of Clint Eastwood's dialogue in Dirty Harry, drafted a loose adaptation of Joseph Conrad's Heart of Darkness by the middle of 1969. Originally titled The Psychedelic Soldier, George Lucas was set to direct before being hired to helm American Graffiti. In 1974 the project came to Coppola, who had just seen both The Conversation and The Godfather Part II nominated for the Best Picture Oscar. 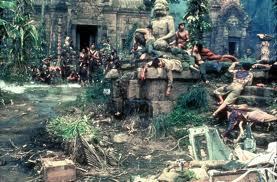 Shooting for the re-titled Apocalypse Now began in March 1976 and was scheduled to last for five months. Soon after shooting began, Harvey Keitel was replaced by Martin Sheen and in May the entire set was destroyed by Typhoon Olga. When filming resumed a month later, Marlon Brando turned up heavily overweight and completely bald; Coppola compensated by dressing him in black, shooting him in shadow and using a body double in the wide shots. While shooting the ending in 1977, Sheen suffered a heart attack and had to walk a quarter of mile to get medical attention. By the time Coppola finished editing the film for release in August 1979, Apocalypse Now was two years late and three times over budget. If you attempted to write down all the things that are wrong with Apocalypse Now, it wouldn't take you long to get quite a big list. For a start, the film is too long - or at least, it feels too long. The story of Captain Willard travelling up the Nung River unfolds at a very leisurely pace, with every section of the river having some major significance in terms of plot or mood. There is no montage or time-lapse footage of the boat rapidly reaching the Cambodian border, and the longer it goes on the less sure you feel that Coppola actually knew where the story was going. There is a very fine line in screenwriting between poetic and ponderous, and Apocalypse Now crawls along this line like the snail on the edge of a straight razor. The actual scenes of Brando reading poetry in the temple are dull; the fact that we can't always make out what he's saying annoys us at first, but after a few lines we couldn't care less. By the time you have reached the temple, you are more or less certain that there will be some kind of brutal final confrontation between Willard and Kurtz, so that even as you sit there soaking up T. S. Eliot, you wish that things would get a move on. Then there is the problem of characters. Martin Sheen is absolutely terrific as Captain Willard, and in spite of his incoherence Marlon Brando manages to match him in the last truly good performance of his career. But as is the way with epics, a lot of the supporting cast don't get even half the screen time they deserve. When you've got a film featuring Harrison Ford, Robert Duvall and Dennis Hopper, you expect them to be on screen a lot. But only Duvall gets the screen time and the character depth he needs, with the other two becoming largely superfluous. Finally, there are aspects of Apocalypse Now which reek of the indulgence present in New Hollywood and 1970s filmmaking in general. This is typified by Coppola's self-referential cameo as the director of a war documentary; Sheen walks into his shot at the river mouth, and he shouts: "Don't look at the camera! Keep on fighting!". If Coppola was making a point about the psychological role of a director, it's handled a lot more clumsily and self-importantly than Peeping Tom. Add in the sequence of a live cow actually being butchered and you have more than enough reason to dismiss this film. 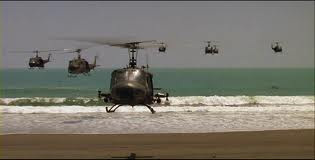 So far, Apocalypse Now would seem like the Vietnam equivalent of Gone With the Wind: commendable for its scale and ambition, but over-long with too many characters and several questionable scenes. And yet, for all the truth in what I have said, none of it really matters. 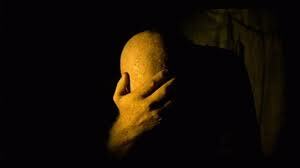 For Apocalypse Now is not a film to be dissected but to be experienced; it will burn its way into your synapses in a mixture of horror and wonder. Watching it is less like making a Swiss watch than walking into a cloud of hallucinogenic vapours. If you refuse to go with it, you won't get it, but if you do, it'll be one hell of a trip. Instead of recreating the experience of Vietnam with a deliberate and calculated sense of hindsight, Apocalypse Now seeks to put the audience in the same place as the soldiers so they can decide how war felt and why men behaved the way they did. Because the script was written during the war, there is no attempt made by Coppola to lecture the audience one way or the other. There are no easy answers to the questions of right and wrong, and the film's slow, meandering tone is vital for us to soak up as much information as we can. Whatever our conclusions, we feel like we've been through hell with these characters, and been changed irrevocably by the horrors of war. 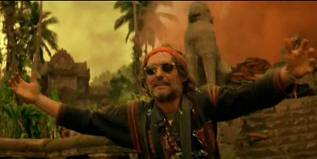 So much of Apocalypse Now is about the chaos of war, and so it's appropriate (at least to some extent) that the film should feel out of control. The relaxed discussions at the beginning, in which Willard's mission is laid out, give us some kind of grounding so that we know where he will end up. But the film is populated by profound and moving insights into the inherent anarchy and absurdity of war. These range from Robert Duvall's insistence on surfing at the beach to the post near the Cambodian border where the troops are fighting without a commanding officer. These scenes produce reactions ranging from laughter to sadness to genuine fright, and often all three at once. Apocalypse Now keeps adding more and more literary aspects to its central story, like someone throwing books into a library that had just been set on fire. The final showdown between Willard and Kurtz is an inventive restaging of The Golden Bough, in which the murderer kills the mad king and becomes king himself. 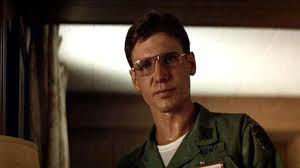 Much of Martin Sheen's dialogue is culled from Michael Herr's Dispatches, which would later be used by Kubrick on Full Metal Jacket. And Kurtz takes on aspects of both Eliot's 'The Hollow Men' and Genghis Khan, whom Coppola studied while the sets were rebuilt. At the heart of Apocalypse Now is the darkness at the heart of all mankind, and the ability of such darkness to consume all that is good and just and sane if fully unleashed. 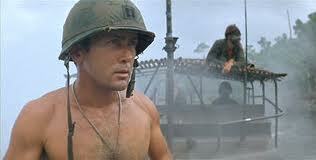 Kurtz has tipped over into this darkness by his experiences in Vietnam. The war has caused him to see the futility and the nonsense in his orders, and he now lives out his days as a hollow man who has understood evil at the cost of losing his soul. Willard kills Kurtz to fulfil his mission, but the very act of obedience threatens to tip him over into the same darkness. Although he manages to resist, he leaves Kurtz's kingdom as a shell of a man, his life shattered by knowledge of that same evil. 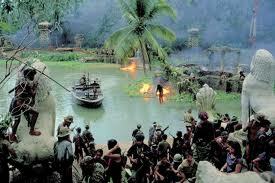 Apocalypse Now is a truly extraordinary piece of work which is fully deserving of its masterpiece status. In spite of its myriad flaws, it retains an indescribable aura which leaves us shrinking into our seats, mesmerised and paralysed with fear and wonder. It's a film which damaged both Coppola as a filmmaker and the New Hollywood movement, whose reputation for indulgence had finally caught up with them. But at the dawn of the blockbuster age, it is a fantastic last hurrah and remains one of the most extraordinary experiences in American cinema. Great review. I just checked your profile because we both seem to be reading Craig's IMDB TOP 250 Challenge blog. I greatly enjoyed reading your very accurate and thought-provoking review, made all the more appealing to me because I just reviewed this film as part of my own attempt to watch all of the films that are part of the TOP 250 at IMDB. I disagree with you on something though. As much as I would like to think that Coppola does not take a clear stance in favor or against the war, I think it is fair to say that by portraying, and choosing to focus, on the disastrous aspect of the American invasion and what it did to break the spirit of good men is as strong of a statement as one could make. It is true that it is not clearly stated, but no good film touching upon the subject of war should, as it would start to feel preachy and artistically inconsequential as a result. Full Metal Jacket feels to me, for example, as less of an indictment as it sometimes glorifies the actions of the military as if they were human feats worthy of praise. Apocalypse Now never goes in that direction, staying away from portrayals that could elevate the action of the American soldier to a level of heroism that it does not deserve. Instead, Apocalypse takes the side of the soldier, not to glorify him, but to pity him. 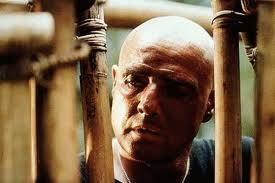 Colonel Kurtz is the ultimate tragic character. He could have been someone important, a leader of men who, because of a senseless war, lost his faith and soul, waiting in the depths of Cambodia to meet his death, which he welcomes in order to free himself of his miserable existence. Thank you for your comment Niels. I don't follow that blog very closely, but I have been trying to push up the number of films I have seen on said list. I think you make a very valid point about Coppola's intentions, but I would still argue that the film leaves the actual morality of the Vietnam War up to the audience. Coppola's focus may be on the disastrous aspect of Vietnam from a character point of view, but it doesn't directly extend into a political indictment of the war. As for Full Metal Jacket, I must disagree. I don't think there is a single aspect of Kubrick's film which glorifies the actions of the military - or if it does, it does so in a blackly ironic way. Its examination of the military is rooted in the concept that the rules and running of the army is inherently absurd. While you admire the characters as human beings, the film never makes out that what they are doing is praiseworthy, at least not from a gung-ho point of view.